Air Comm can handle all of your equipment rental needs at an affordable price. Our commercial duty lines of Motorola and Titan radios and accessories are perfect for any event! Please call our experts to order the line of equipment that best fits your needs and budget. Ultra-Lightweight at only 4.9 oz, rugged and durable, repeatable capable, long battery life, 16 channels, and 2 watts. Perfect for outdoor events such as fairs, carnivals, sports, conventions, and building events with 1 – 5 stories. Outdoor range up to 3 miles. More powerful option at 4 watts, 9.9 oz, rugged and durable, repeatable capable, long battery life, 16 channels, and 2 watts. Perfect for larger outdoor events. Outdoor range up to 5 miles and building events with 1 – 15 stories. One-touch calling, quick text messaging, and enhanced call management. The perfect communications solution for professionals. Operates on 160 channels and includes an integrated GPS modem. Its tri-color LED indicator offers clear, visible feedback for its calling, scanning, and monitoring features. 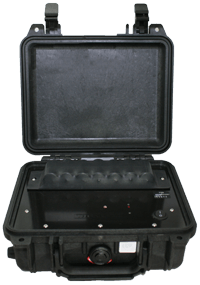 This lightweight and rugged device can operate concurrently in digital and analog modes. The CP200d has superior audio quality, outstanding coverage, and long battery life.